The UN’s ‘Leader for Tourism’ is set to launch an ambitious scheme to build a new ‘Disneyland in Africa’. Yes, Robert Mugabe, that well known barrel of laughs and tourism guru has decided that Zimbabwe needs a bit of a rebrand and has settled on a giant theme park as the way to make that happen. Walter Mzembi, the tourism and hospitality minister, told New Ziana, the official news agency, that the government was planning a $300m (£193m) theme park near Victoria Falls, the country's top tourist attraction. And by $300m we are of course not talking Zimbabwe dollars as this page wouldn’t fit all the zeros in. 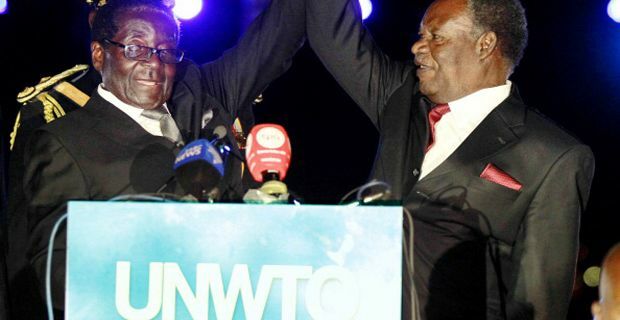 It was Mzembi who uttered the magic words, "Disneyland in Africa” before going on to paint a picture of a neon paradise involving casinos, shopping malls and entertainment facilities. One wonders is they will be good humoured enough to incorporate their recent history into some of the attractions – the ‘Rampant Inflation Rollercoaster’ perhaps or ‘Forcibly Seized Mountain’ or perhaps even a shoot em up game called ‘Ballot Box Intimidation’. "We want to create a free zone with a banking centre where even people who do not necessarily live in Zimbabwe can open bank accounts," said Mzembi with a straight face. And while there is no doubt that international investors concerned about the Eurozone crisis will be fighting each other to stuff money into the notoriously reliable Zimbabwean banking system, the government seems confident that ‘if you build it, they will come’ across the entire spectrum of tourism, business and boom. The government says it recorded a 17% increase in tourist arrivals in the first quarter of 2013, up 346,299 to 404,282, many of whom head straight for the majestic Victoria Falls. It has predicted the tourism sector will contribute 15% to GDP by 2015 if the country remains stable. Zimbabwe: is tourism back on track?